I have read conflicting things about the outcome of doing that. I have some folks who swear by high end rippers and others who say it can be done with just a normal computer and the right software. What are your thoughts? LOL, I had to enlist my wife to aid in the process. Once you get it down, it's just very repetitious. I only ripped a couple hundred, I'd hate to rip a thousand or so! Joe, I'm not schooled enough to know the difference. I just did a trial of dbpoweramp and ripped to Flac. Playing through my OPPO UDP-203 and PS Audio DAC. The files sound just about as good as the CD's, it's more about convenience I guess, I listen to CD's when I'm puttering around the house, doing whatever. If I want to do some Real Listening, I put on an LP. Somehow better quality than the streamed version. A Streamer of some sort is on the "The List". I'd like to experience what Streaming has to offer. I'm looking at a Bluesound Node II, then I can do a comparison as well. Ripping is easy, but tedious. I have been using iTunes to RIP them to lossless ALAC (Apple's version of FLAC). As far as how they sound that is completely dependent on the player. A PC playing the files is the absolute worst way to play them. With my Lumin they sound superb. While the CD player does sound good, it is not the equal of the Lumin. Plus, with ripped files you can make playlists of your favorite songs. I have multiple playlists now with a total of over a 1000 different songs. This also contains files I downloaded from HDTracks. Do you run the CD through the Lumin for playback ? No. The Lumin plays the ripped file. The CD sits on the shelf gathering dust. Joe, I should have said "I'm using the OPPO as a Server into the PS Audio DAC"
you need a top shelf transport. I originally used EAC (Exact Audio Copy) which is a free software but now I just use JRiver. And after a while, and since I have under 400 CD's, plus, since storage is so cheap now days, I started just ripping everything in uncompressed WAV. And I just use my PC's drive. You really don't need anything fancy. Nice, Mike, kinda fun, isn't it? What's not fun, though, is when you're just starting, and testing out different stuff in your process, and ending up having to re-rip. I ended up Dynamatting my optical drive and bits of the chassis mostly just because it would vibrate the whole chassis during high speed rips. Next up for you - maybe digital video library? LOL, I don't have enough Video content to make that a worthy project. I've had thoughts of Digitizing my Vinyl collection one day, but then I think "why put all the Analog Sweetness on a Digital File"
The conversion/transforming of CD or Vinyl to actual digital format is pretty simple. CD are already in digital format (101010), so you are just making a copy of a digital file. The format you choose and playback unit is where you will hear differences from the source. The software out there today is on par with one another, If it gives you the option to rip to Flac to Mp3 you are covered. The argument of bit perfect copy is more about fuzzy math since all computer data is transferred bit to bit. Playback is a different deal, if you are using a computer/NAS or some other storage drive it is not the issues anymore as with most software the part you are using (program/files) are stored in a cache memory. Using a computer comes with other parts that can generate hums and vibrations (fans). I would recommend a storage device that you can connect directly to you playback device or to your network. Storage space is so cheap now days its a no brainer. You can pick up 2-4 TB for under a $100 bucks. I have several devices ranging from 350GB to 4TB some acting as backups to others and others as extra storage space so I don't fill up the main drive with photos/videos or music. Ripping is one of the first mind numbing task that comes with digital storage, but like the old days of Dbase I-IV, someone has to enter in the data. 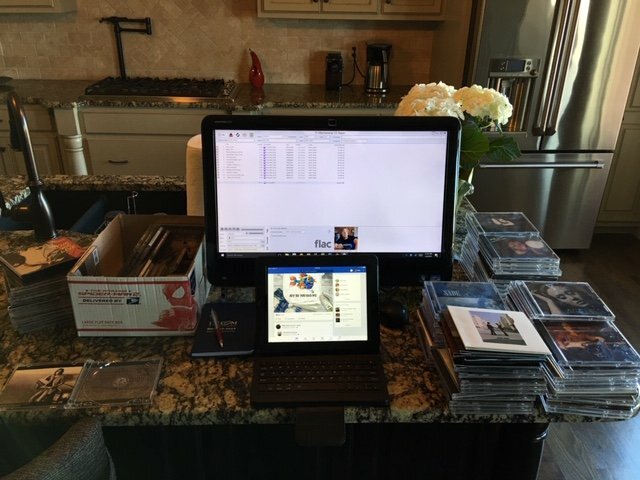 The second step is tagging, the music industry likes to get the last laugh and making you tag your collection of CD's or Vinyl that you have collected over half if not more of your life time is a task for the dedicated audio fan. I just posted a video on this subject, so go check it out if you are a beginner or a long time digital fan that never took the time to tag each and every song you have. Downloaded tracks are nice as most are already tagged properly, but some CD's are not or don't have any info at all on the disk, all you get is track 1,2,3,4..... Classical music is notorious for such things, also Greatest hits CD's play this game. Its a labor of love, but once you done it you will truly enjoy your music on a level that you never dreamed of. Playback, as with any part of your system what you hear is dependent on the ability of your equipment. Most important fact is this, a good recording will sound good on most systems, a bad recording will sound bad or worst on better gear. From a Sonic stand point, quite possibly. From the convenience side, a worthy endeavor. Sonically it's usually better and for convenience worth all the effort. Oh, I meant joining the 21st Century. As recoveryone stated: "Storage space is so cheap now days its a no brainer." I have a NAS with several bays to add additional HD's... so when I rip my CDs, I keep them in WAV format, uncompressed - the 'full meal deal.' They say that FLAC/AFLAC, (and even WMA to some extent) are great compression formats, but with storage cost per TB so inexpensive, I don't bother, thinking that the 'full snapshot' is the best format, no matter how clever the compression algorithms are. Now, if/when I need to keep a library of files for mobile devices - phone or ipod type devices, then I'll look more into having a special library of condensed files for those. Where in the world did you find the time to rip 25,000 CDs? I bet he forgot a decimal point. 2.5k albums, I bet. That's a respectable number! More than me, I ripped about 550gb of music to flac. I'm not sure how many albums that is. The sad part is that was the second time I did it. Many years ago I had ripped everything to MP3. D'oh! That's a lot of work in anybodies book!